If you’re looking for an auto dealership that can serve your automotive needs, we want to provide you a list of reasons our customers tell us that they come to Suburban INFINITI of Novi. “Certified” INFINITI vehicles – INFINITI has trained Suburban INFINITI of Novi mechanics to inspect and repair our used INFINITI vehicles to bring them up to the stringent standards required to be classified as certified INFINITI cars. Easily accessed location – Located at 24355 Haggerty Rd in Novi, we make it very easy to get to our facility. Accessing our location from I-275 or I-96 makes for an easy commute to our dealership. Family-owned business – The Fischer family has owned car dealerships since the 1950’s and Suburban INFINITI of Novi is proud to be part of the Suburban Collection dealership group, all striving to maintain the same levels of superior customer satisfaction and service. 1,700+ used cars in stock – Being part of the Suburban Collection of dealers, our metro Detroit based dealership has plenty of used cars on-site and access to over 1,700 other vehicles in the metro Detroit area. 4.9 out of 5 star rating on DealerRater* – We’re particularly proud of our 4.9 rating at DealerRater – the premier automotive dealer rating service. Over 72 customers have spoken up on our behalf. DealerRater has over 700,000 reviews, and gets over 850 new reviews every day! 5 out of 5 star rating Yelp* – Our customers have taken the time to write great things on Yelp about their service at Suburban INFINITI of Novi. Delivery to your location – Our staff is happy to deliver your new or used vehicle, free of charge to your work, home or location of your choice. Professional, customer-focused management team – Our General Manager – John Chatzopoulos and our Sales Manager – John Gangler, along with Kevin Hoover our Service Manager and the rest of the management team are here to assist you and make sure your experience is nothing short of amazing! Suburban warranty on used cars – We offer our own warranty on many of the used cars we sell. Internet sales team – We have an Internet sales staff to assist customers that prefer to do business over the Internet, or just can’t drive to the dealership to get questions answered. 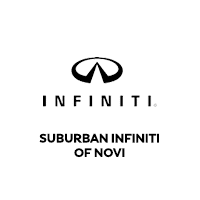 Novi‘s newest dealership – Suburban INFINITI of Novi has the most up-to-date facility in the area. Having been remodeled recently, the showroom, mechanics bays, tools, and customer waiting area all have the latest amenities and are designed with the industry’s best practices in mind.